View a list of facilities and services in the Chemistry Building. Rooms in Shain Research Tower number 11XX to 81XX and include room/office numbers where the second digit is 1. Floor 1 includes an the Shain Atrium, the Business Office, and the mail room. Floor 2 includes the graduate admissions and careers office and parts of the Chemistry Instrumentation Center. Floors 3 and 4 are not publicly accessible. Floors 5 to 8 house research labs, offices, and seminar rooms. 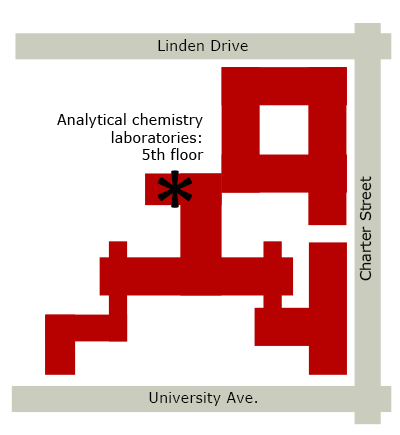 Due to different floor-to-floor spacing, the Shain and Mathews sections are connected only on floors 1, 2, and 5. Rooms in the Mathews Building number B2XX to 62XX and include room/office numbers where the second digit is 2. The basement houses the physical chemistry instructional laboratory, classrooms, offices, and the Glass Shop. Floor 1 includes the shipping and receiving room and the General Chemistry TA offices. Floor 2 includes the Electronic Shop and part of the Chemistry Instrumentation Center. Floors 3 to 6 house research labs, offices, and seminar rooms. The Mathews and Daniels wings are connected on floors B through 6. Rooms in the Daniels Building number B3XX to 93XX and include room/office numbers where the second digit is 3. The sub-basement houses the Instrument Shop. The basement includes the Chemistry Learning Center, instructional laboratories, and classrooms. Floor 1 includes the Mills Street lobby, lecture halls, Seminar Hall (Room 1315), instructional laboratories, and classrooms. Floor 2 includes the Chemistry Library (at the north end), instructional laboratories, classrooms, and the Analytical Chemistry TA offices. Floors 3 to 7 house research labs and offices. Floor 8 includes the Theoretical Chemistry Institute, research labs, and offices. Floor 9 includes CompHelp, the Research Computing Center, lounge, and offices. Beginning June 2017, the Department of Chemistry will operate all undergraduate analytical chemistry laboratory classes in the Medical Sciences Center.